If you want to shave and groom your facial hair, there are safe and effective ways to shave -- without cutting yourself or causing dry skin. Because men's beards are typically very thick, removal methods such as plucking and waxing are impractical and painful. 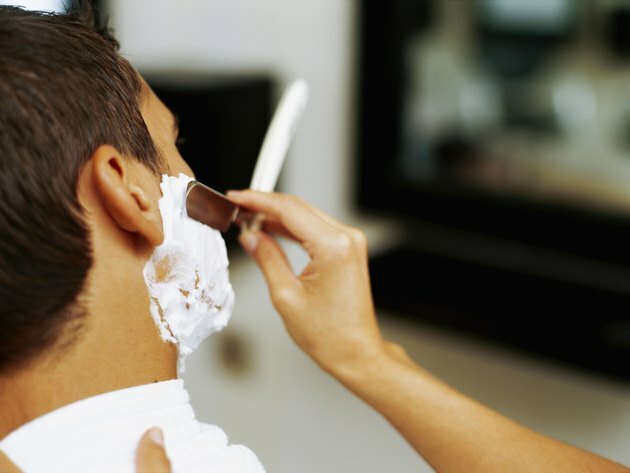 Shaving and depilatories are better alternatives for men that provide quick if temporary results. For results that last longer, you may want to look into laser light and electrolysis treatments, which are expensive but potentially permanent. Use a straightedge razor for a smooth, close shave. Prep your beard by applying a warm towel and plenty of shaving cream to soften and lift the hair bristles. Hold the straightedge blade at a 90-degree angle to your skin and scrape it across your skin against the direction of hair growth using short strokes. Adjust the angle of the blade to as low as 30 degrees for a sharper shave. Do not pull the blade horizontally across your skin. Use an electric razor for a quick, cream-free shave. Soften your facial hair with warm water or a pre-shave gel. Hold the skin of your face taut with one hand as you move the razor against the direction of hair growth. Rotate the razor in circles if you are using a rotary model. Try a depilatory in cream or powder form. Apply a coin-size amount of either product to your arm and check over the course of 36 hours for a skin reaction before using it on your face. Mix 2 tbsp. of the powder formula with an equal amount of water to form a paste. In both cream and paste formulations, spread the product over your beard without rubbing it in. Allow it to sit for the directed time and wipe off with a damp cloth. Rinse with water. Have electrolysis performed on your beard. Avoid getting your facial hair wet for at least six hours before your appointment. The dermatologist will aim a needle at the individual hairs on your face and conduct electricity down the shaft, destroying the hair cells. Take analgesics before your appointment to help numb any pain from the procedure. Schedule weekly appointments and plan for yearly follow-ups. Remove hair with laser treatments. Avoid the sun before going in for treatment. Give your dermatologist an accurate assessment of how easily you sunburn or tan and inform him of your family's ethnicity since genetics will affect your skin's sensitivity to the laser light. Attend the full cycle of treatments recommended. Beard removal often requires at least six treatments. Follow up yearly if hair grows back. Apply aftershave to your skin to soothe it and prevent razor bumps.